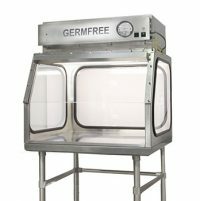 Germfree’s Laminar Flow Workstations and PCR Cabinets offer a high degree of localized control for critical processes, providing a sterile environment for the handling of materials. The work area is continuously bathed with ISO 5/Class 100 HEPA-filtered air to protect the product from contamination. These units are constructed of high quality, all-welded stainless steel with a pharmaceutical grade finish. 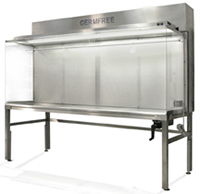 Germfree’s Vertical Laminar Flow Cabinets provide an ultra-clean working environment when a deeper work area is required. The work area is continuously bathed with positive pressure HEPA-filtered air to protect the product from contamination. Unlike the Horizontal Laminar Flow Hoods, the BV Series provides an extra deep (30″) work area with filtered air from above. This airflow allows for maximum utilization of the full work area, especially with the use of an automated compounder. 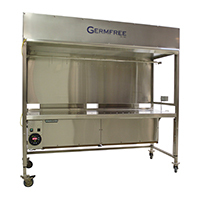 Germfree’s Horizontal Laminar Flow Cabinets provide an ultra-clean working environment for critical processes. The BZ Series of Horizontal Laminar Flow Hoods are designed for the handling of materials in an aseptic working environment. The work area is continuously bathed with positive pressure ISO 5/Class 100 horizontal laminar flow air that has passed through a High Efficiency Particulate Air (HEPA) filter. This filter removes organisms and particulates 0.3 micron in size with an efficiency of 99.99%. The laminar flow principle consists of moving individual streams of unidirectional, ultra-clean air along parallel lines with minimal turbulence. Germfree manufactures PCR Workstations for processes involving Polymerase Chain Reaction amplification and manipulation of DNA and RNA. We offer a range of PCR cabinets, including units that protect personnel and the work environment while protecting samples from contamination. Amplification processes are very sensitive and proper sterility levels are required to achieve accurate PCR results. Process contamination and cross-contamination are a serious concern. Therefore, it is imperative that PCR work is conducted within an environment where air quality is controlled. Additionally, certain PCR applications require personnel protection from potential particulate and aerosol hazards.